College students are more stressed out than ever before — at least according to the latest findings of a large, national survey that has been conducted annually for the last 25 years. The survey includes more than 200,000 students attending nearly 300 colleges and asks them to rate how their own mental health stacks up with their classmates. The most recent results indicate that fewer and fewer freshmen feel like they are in top form in terms of coping with stress. We all know what causes stress and we all know that stress is bad for you. What is less well-known is exactly how stress affects your body and how massage reverses the physiological effects of stress. Stress remains in our bodies causing muscle tightness, high blood pressure, and a sense of fatigue. Prolonged stress wears down the immune system and leads to illness in various forms.Over the long-term muscles and blood vessels become less elastic, arteries develop cholesterol plaques, digestion becomes sluggish, and sleep doesn’t feel refreshing. We find it difficult to ever fully relax even after exercise. Massage for today’s stressed student acts as a natural bio-feedback mechanism. With regular massage, our bodies learn how to return to the “rest and digest” state with more ease. We are less likely to get stuck in the “fight or flight” stress reaction. Hence, we actually learn to deal better with stress on a physiological and psychological level. Regular massage is an excellent method for combating the effects of stress and enhancing one’s health. Reducing one’s stress response not only feels good at the time, it improves one’s ability to focus and be successful academically. Not only does massage feel fantastic, it is also fantastic for your health! Seattle University discovered that stress levels among students are climbing. Students have a heightened demand for excellence in today’s competitive market. it is a rough economic climate causing difficulty securing financial independence. Helping students alleviate stress has become a primary focus for Seattle University. As a result, starting in 2016 Seattle University is offering massage services on its campus for faculty, staff and students. Many companies have already adopted workplace massage seeing its benefits of reducing stress and improving productivity for employees. Colleges are now realizing those same benefits apply to their students’ overall health and well-being. 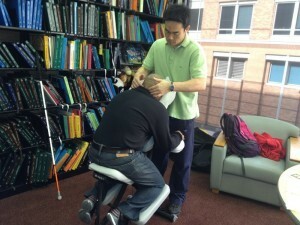 Seattle University chose Dreamclinic for its on-campus seated massage based on its standing as the leading provider of therapeutic massage services in the region. Dreamclinic has begun offering massage services at Seattle University’s campus as of January 2016.